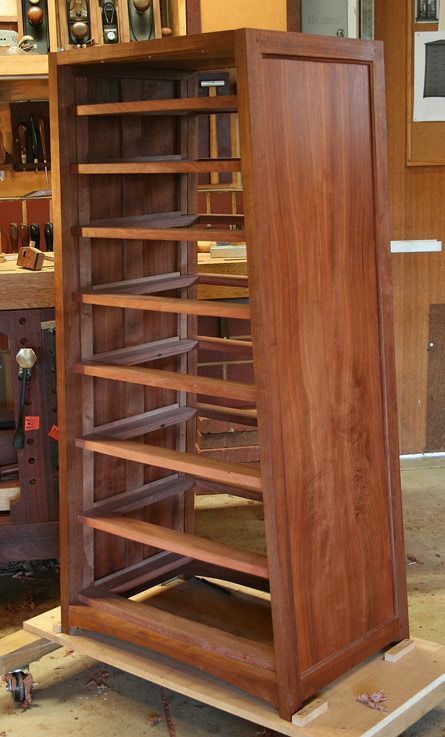 I thinking that the upper drawers can be built oversize and shaped to fit. However the lower drawers will slope more, and this will affect the thickness of the side boards (quarter sawn Tasmanian Oak - looks similar to White Oak). Ideas and suggestions on how to build the drawers to fit at the sides? As always! Thanks for posting. Great job. The construction issues that you were dealing with is way too complicated for most people in the world. It is also very difficult to explain the process with just words, since some of us are visual learners. I have read your post, great job. Thank you for sharing. The methods used are pretty much what I would of done. Thank Tony. Thanks Freddy - it is helpful to get confirmation that what is planned is not inefficient. I am interested to know how you would make the groove in the drawer front for the drawer bottom? Score and chisel? Power router? Curved fence clamped on the router table and a 3 wing cutter with bearing is how I would of cut the grooves in the curved front. Or you can put a curved base out of wood on a laminate trimmer with a hole for the router bit. Or you can scribe and chisel groove, and clean up with router plane. All are good options. Thanks Freddy. The router table seems the best option. I have come up with a idea that will simplify the half-blind construction. If you recall, the curve requires that the tail board have angles at the baseline and end. It occurred to me that I would not need to angle the baseline - which is required for a gapless fit - if the pin area is squared (rebated) first. That would make it easier to ensure the join is tight in that area. Thanks David! That's exactly what I plan. Very helpful to see it being done. You have a great site, and I have spent a good time looking through - not sure how I missed this article. Here is the next chapter in my lingerie chest build: the drawers. Just two of eight so far. I cannot believe how long each one is taking! Hopefully I shall speed up as I now understand what is needed. I did promise to post once I had a few done. I shall not get back to the build for about a month as we are off to the UK for a few weeks. These are compound angled drawers, with a bow front and angled sides. There are flush beaded slips, amongst the details. Just completing the thread - this is a contemporary piece and does not belong on this forum. Still, many of the techniques borrow from the past, and may be useful to someone. I say it belongs. This is 21st period and we are all about period period period. The piece came out stunning. I believe English and French Furniture belong here. Where do we think furniture was first made. Not here in the US of A. I think of it as the society of period furniture. Bring in all the Krenovian, Maloof, Arts & Crafts, Art Deco, Victorian etc.